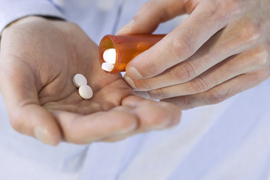 Pills or muscle relaxants can’t correct the nerve compression caused by a bulging disc. Sciatica is a distracting pain that begins in the lower back and extends down one or both legs. It typically worsens with periods of sitting or standing. The discs between the spinal bones of the lower back are often involved. Trauma can cause one or more discs to bulge. This crowds nearby nerves, causing irritation and inflammation. Coughing, sneezing or other kinds of movement can be painful. If neglected, the nerve irritation extends down one or both legs along the sciatic nerves. The pain appears in the leg, but the culprit is often the lower back! Fortunately, improving joint motion in the lower back with a program of chiropractic adjustments has produced results for many people. It all starts with a consultation and thorough examination. If we think we can help, we’ll tell you. And if we don’t think we can help, we’ll tell you that too and refer you to someone we think can.